Find out why companies are employing Dynamic Case Management. Smart companies are serious about successful complaint management, and realize the benefits of providing outstanding customer service. 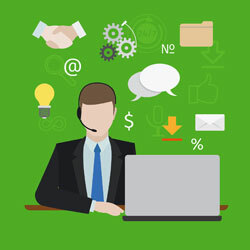 In today’s ever-changing business environment, customer service requests are more complex and, at the same time, demands for instant gratification are higher. Geographically distributed offices, a myriad of compliance rules, pressure to reduce costs, and the ease of customer defection all contribute to the critical need for great customer interactions. In order to handle rising complaints and customer demands, organizations can employ a discipline called Dynamic Case Management (DCM) to run agile service processes and overcome the challenges of the unpredictable business and customer service environment. It’s impossible to predict every type of complaint situation or to program a system for all future scenarios. A DCM system will be able to manage unstructured processes and unexpected changes. The system will also adapt to the context of each customer and support process change for each role, at any time. Task management, when executed well, enables effective distribution of tasks to most appropriate users based on their skill set, availability and other manager determined attributes. Coordinated task management adds to efficient case processing which should also incorporate collaboration and last minute change capabilities. Integrating organization’s knowledge throughout the complaint resolution process will allow the system to adapt and offer the needed information at the right time to make agents more effective. Utilizing multiple sources, the system should provide contextual information according to situational changes. A 360 degree view of each customer, including past interactions, in a single user interface, will provide agents with critical information to quickly and efficiently resolve complaints. Additionally, knowing the customer and the problem is essential for providing outstanding customer service. Today, customers expect almost real-time complaint resolution and want to be able to communicate with organizations through a wide variety of channels (e.g. e-mail, phone, SMS, mail, web, social media). Multi-channel integration will allow agents to provide consistent high quality service through the channel that the customer most prefers. Having action scripts will help bring down training costs and assist agents to ask customers the right questions while going through the complaint resolution process. Agents will be well equipped with adaptable prompts to successfully bring each case to conclusion. The complaint management system should track case processing history, allow real-time process visibility and provide powerful statistical tools and analytics. Managers should be able to review, on-demand, how and by whom a case was handled. Additionally, managers can use statistical data to continuously improve the process. The entire complaint case management process should be handled within one system for ease-of-use. Well integrated systems are imperative for making the agent’s job easier by providing a unified interface with multiple communication channels. Though all these elements may seem like a lot to factor into handling complaints, DCM is a rapidly growing category with solutions that have made a huge difference in the cost structure and feasibility of addressing customer complaints head on. Companies and organizations within a wide variety of industries and disciplines are already making significant inroads in terms of cost, case resolution, and compliance using advanced DCM practices. Glen Schrank, is the Chief Executive Officer of Cirro, the industry’s first provider of enterprise data fabric technology. Cirro’s technology unifies the data ecosystem by providing access, intelligent integration, and management of all enterprise data regardless of type, engine or location. As a technology visionary and leader, Glen has spent over 25 years in executive roles building and growing next generation technology businesses. How Well Do You Treat Your Internal Customers?